We're just over here like . . . 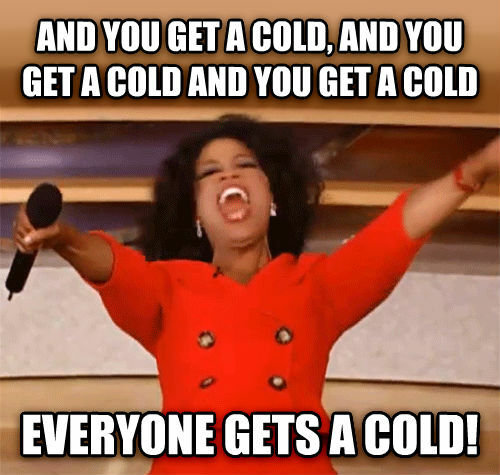 Except with strep throat .... ahhhh. We get it Oprah ... WE GET IT! Yesterday, I had to go get Cooper from school early due to him not feeling well. Since he & Millie Jo both have been running low grade fevers off & on since last weekend, I went ahead & made them both doctor appointments for yesterday afternoon. Y'all ... Coop has a sinus infection AND strep throat & Millie Jo has a sinus infection, a ear infection AND strep throat. Whhhhhhat!?! Goodness gracious we are ready for Spring temps to stick around so we can all start feeling better. So today I am playing doctor & taking care of my sweet kiddos. Coop's birthday is tomorrow so please pray that they both feel better fast! Hope everyone gets to feeling better soon.